...as a mom than watching my sweet daughter experience her new life one "first" moment at a time. I love watching her try new things. I love guiding her to check off as many boxes in the game of life as possible. Everything is so new to children! I love the fresh perspective it offers. 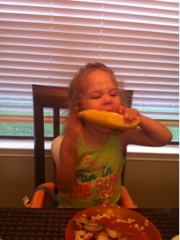 This past week, Chloe tried corn on the cob for the first time. I love that 2 years later we still haven't run out of adventures. She'll be 30 someday and if she allows it, I'll be there for still more new experiences and adventures. Did I just get sentimental about an ear of corn? I think I did. As a mom, I'm entitled to it! 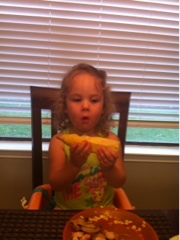 I foresee a bbq at Shorty and Pop's...complete with ribs, corn on the cob and probably some bbq chicken too. It's so true- seeing the 'firsts' are just amazing - it never gets old seeing them do something for the first time. I love it! 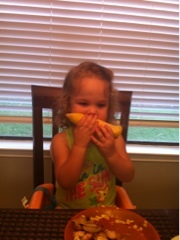 Look at Chloe loving her corn on the cob - so sweet! Kim, I have walked in those "forever" shoes for many wonderful years. I never stop loving new memories that my family shares with me. I firmly believe in stoping to smell the roses. 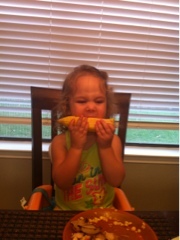 Chloe is doing a good job on that corn cob. I bet she will be ready for another one real soon.She looks so cute sitting in her chair.